Hyde won't play against the Rams. 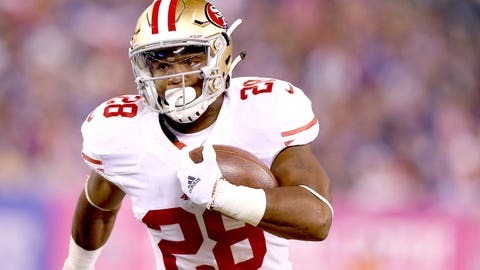 San Francisco 49ers running back Carlos Hyde has been ruled out of Sunday’s game at the St. Louis Rams because of an injured left foot. Hyde, the NFL’s ninth-leading rusher with 470 yards on 115 carries and three touchdowns, did not practice this week. Coach Jim Tomsula had previously said the decision to play Hyde on the artificial surface at St. Louis would be made on game day. But the 49ers said after Friday afternoon’s practice that the team’s medical staff met with Tomsula and officially ruled Hyde out. Without Hyde, San Francisco is likely to turn to 10-year veteran Reggie Bush, who has been in and out of the lineup with a calf injury. The team’s other available running backs are rookies Mike Davis and former Australian Rugby League star Jarryd Hayne. In four games, Bush has eight carries for 28 yards and four receptions for 19 yards. The 30-year-old was signed to a one-year deal in March after stints with the Saints, Dolphins and Lions. San Francisco (2-5) has the league’s lowest-ranked offense in both scoring and yardage. With Hyde leading the way, the 49ers rank 17th in rushing offense, averaging 110 yards per game. NOTES: WR Anquan Boldin said he anticipates playing Sunday despite being listed as questionable with a hamstring injury. The injury was sustained in an Oct. 18 win against the Baltimore Ravens. Playing with the injury last week against Seattle, Boldin had three catches for 39 yards. … 49ers CEO Jed York had an unplanned meeting with local reporters coming off the practice field Friday and said he would formally address the media at a later date.